LISTEN stands for „Learning from Intercultural Storytelling” and is a two year project (12/2016-11/2018), co-funded by the Erasmus+ programme of the European Commission and the German Federal Ministry for Education and Research. The beneficial effects of storytelling for learning have become ever more widely acknowledged in recent years, not least through efforts of engaged storytellers to spread their art to other domains of life. 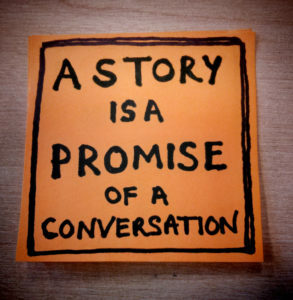 The aim of LISTEN is to use “applied storytelling”, meaning storytelling without “professional” storytellers, in its many forms and functions as educational approach for the work with refugees – be it to support language learning, to exchange about cultural differences, to create visions etc. In order to give refugees a voice in the receiving societies and to support their integration, LISTEN will explore different approaches to storytelling and how radio and other forms of audio broadcasting (e.g. podcasting) can be used as medium to share those stories. Based on research and practical experiences, LISTEN will create a handbook for trainers and a collection of refugee stories from all over Europe that shall create awareness, support inclusion and give a helping hand to those who wish to set out for this journey too.